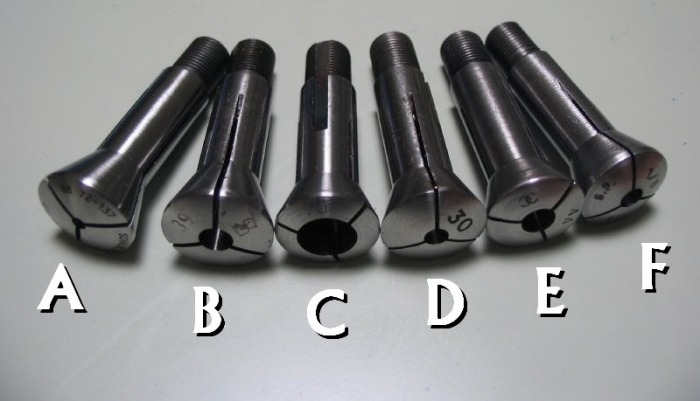 A topic which gave me some confusion in the initial stages of choosing a lathe was the notion of collets. Collets, or wire chucks if you prefer, are a very important accessory to the watchmaker's lathe. 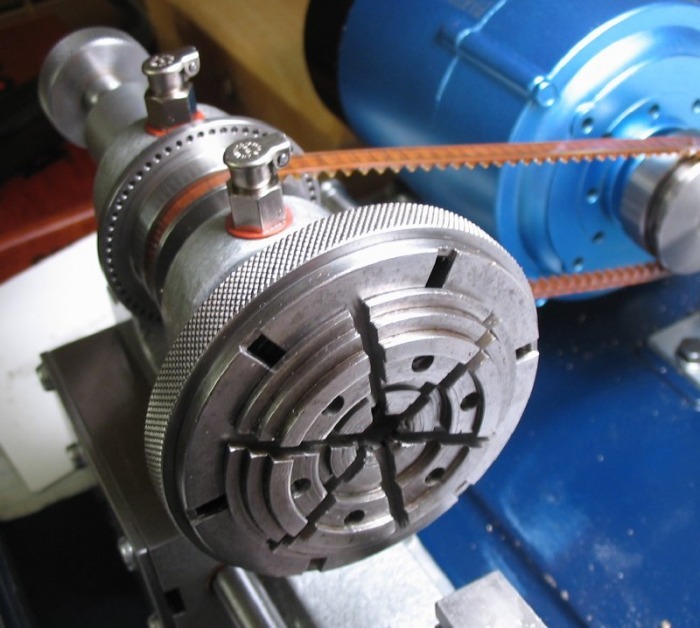 The ability to use them is one of the primary reasons for choosing a watchmaker's style lathe over another. For example, the Cowells 90ME has some advantages over the 90CW, but the ability of the 90CW to use collets in the headstock and tailstock is a definite advantage for horological purposes. The bottom line is that just about every manufacturer of "8mm" collets makes or made them ever so slightly different. 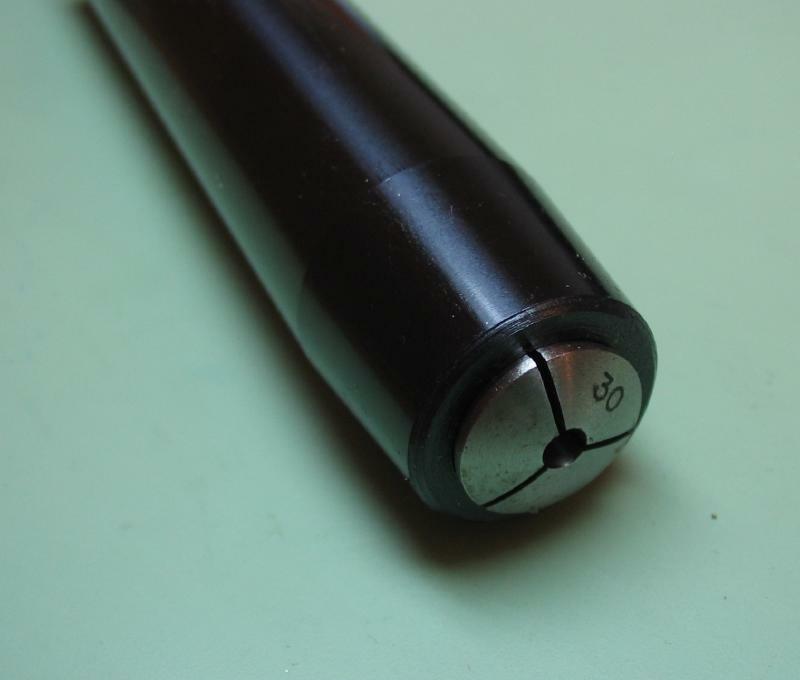 The length, body diameter, thread dimensions, etc. can be somewhat different. Although a collet may physically fit in a given lathe it may not be dimensionally correct, and the possibility of error of concentricity can exist. There are various sizes to become familiar with and is well beyond the scope of this web page. Archie Perkins "The Modern Watchmakers Lathe and How to Use It" and Donald DeCarle "The Watchmaker's and Model Engineer's Lathe" are both good references for a more complete discussion on this topic. For the Cowells 90CW lathe two types of collets can be used, American Webster-Whitcombe (WW) and European B-8. These are approximately the same, differing in their thread dimensions. B8 collets are 6.82mm x 0.625mm pitch with 55 degree threads. "WW" collets may be 0.275" x 40TPI or 6.985mm x 0.635mm pitch. However, the Webster/Whitcomb collets were originally designed by The American Watch Tool Co. that was bought out by F.W.Derbyshire,Inc. in 1918 and had a 0.625 mm pitch and 60 degree threads. F.W.Derbyshire, Inc. still manufactures W/W collets to original specifications. Cowells will make drawbars for either of these two dimensions, generally, the WW drawbar will fit both types , however, the B8 drawbars seem to bind on WW type collets. The number of manufacturers making these types of collets is relatively small. For B-8 collets, Schaublin is the predominant maker. Their collets are hardened and ground, and overall are well made. This is the brand offered for sale by Cowells and other lathe makers such as Horia-Steiner. 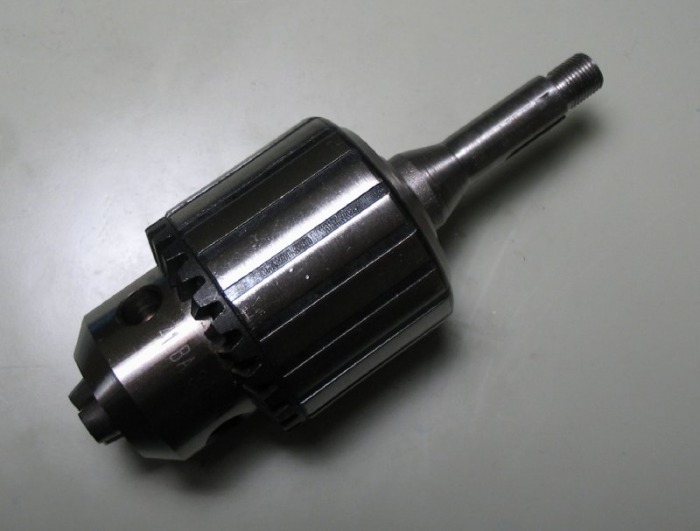 Bergeon offers a B-8 collet, as with many of their products, the manufacturer is not disclosed. There are several WW collet makers in the USA. Top quality WW collets are made by Levin, Derbyshire, and Hardinge. For much less expensive unhardened (mild steel) WW collets, Sherline and a brand sold under the name Starrett (not to be confused with the toolmaker, L.S. Starrett) are popular. I purchased several Sherline brand collets and I am quite pleased with them, they have a good tight grip and they are inexpensive when compared to the other makers. Below are the catalog pages pertaining to B-8 collets from the Schaublin catalog. I primarily use Schaublin collets and a few, but ever increasing, number of Sherline collets. While purchasing a set of second-hand Schaublin collets I received a number of miscellaneous other collets as well. A selection of collets is shown below, all of which 'work' in the Cowells using either the B-8 or WW drawbar. 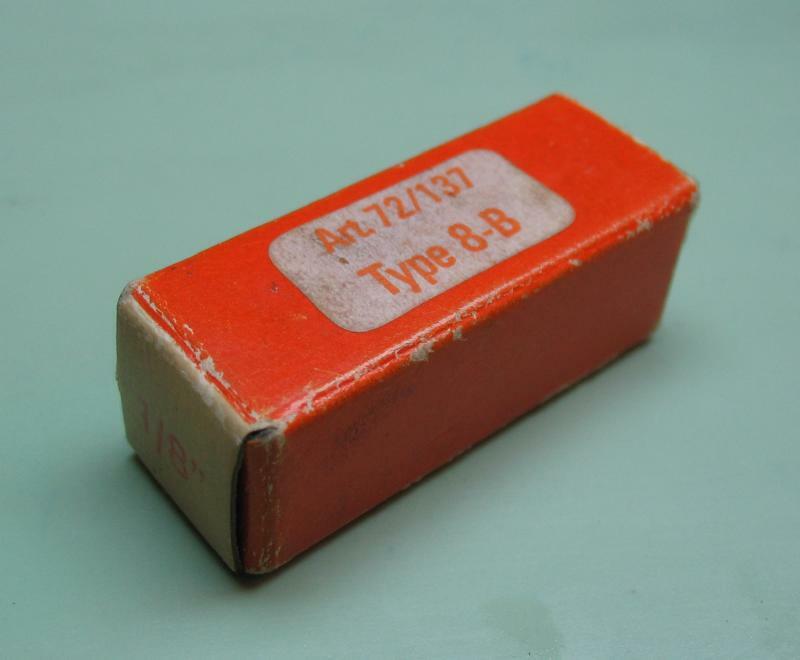 An old stock Schaublin collet, labelled "Type 8-B". Older stock usually has the overlapping Sv logo etched on the collet face along with the size. It is 1/8" holding, a very useful size in the U.S. for holding drills, countersinks, as well as metal stock which are readily available in inch sizes. 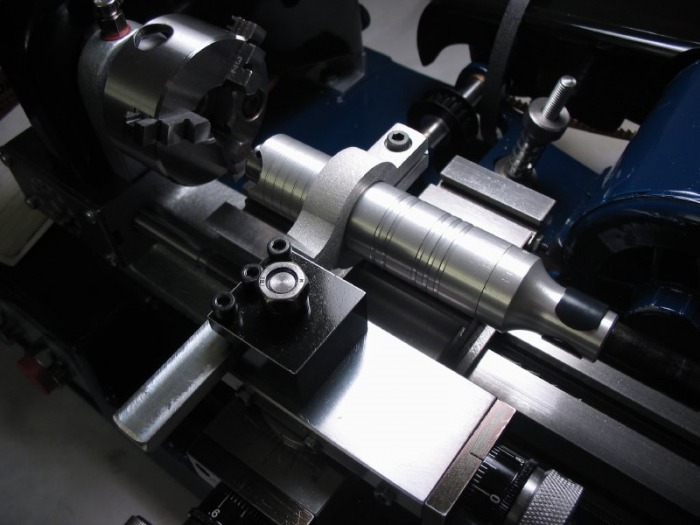 A number of different projects on this site involve the fabrication of tooling with a collet-type shank. 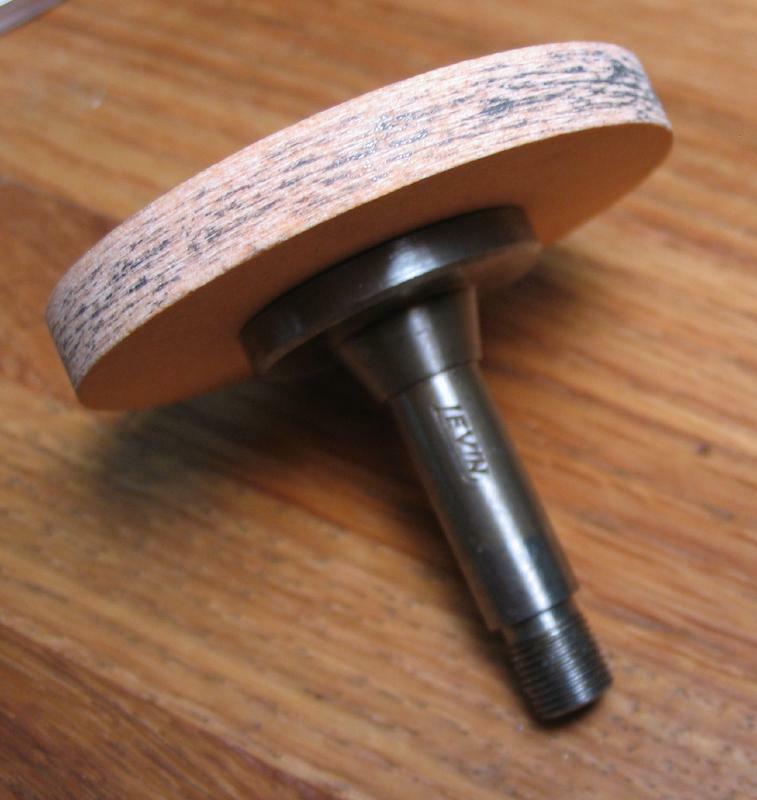 These are, of course, intended for mounting in the headstock, tailstock or other collet holding spindle of the lathe. 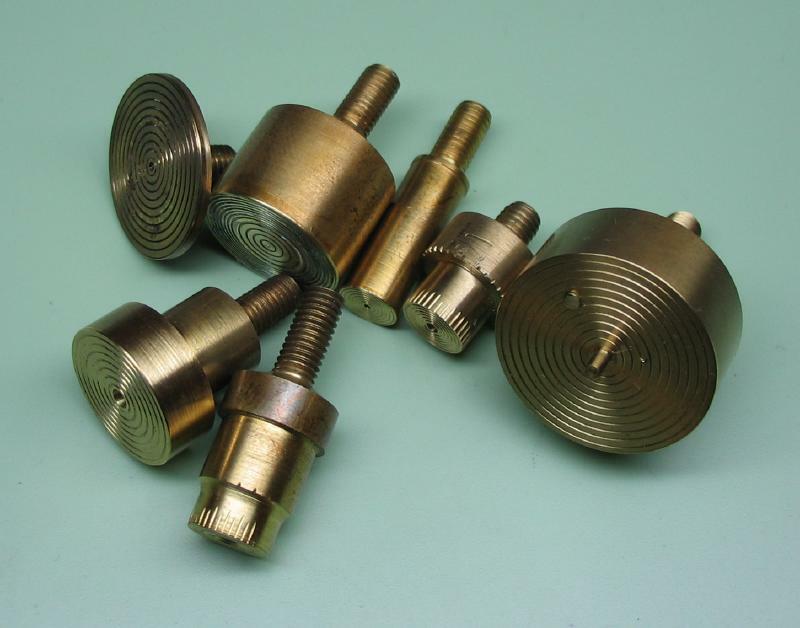 The B8 threads are formed with a die, however, these dies are not readily available. The closest available (at the time of its purchase) was from a tool dealer in Germany (GG Tools), it is not exactly B8, but was close enough to work (6.85mm x 40 TPI (0.635mm). Later, I received a friendly solicitation from a visitor to this site who was assembling a group to order a batch of custom made dies to Schaublin's B8 specifications. 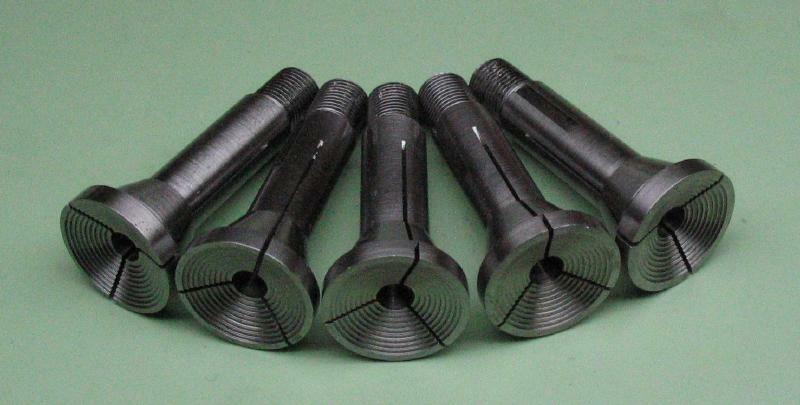 These were made by Tapco to Ø6.82mm x 0.625 with Whitworth (BSW) thread form (55° with rounded crest and root). 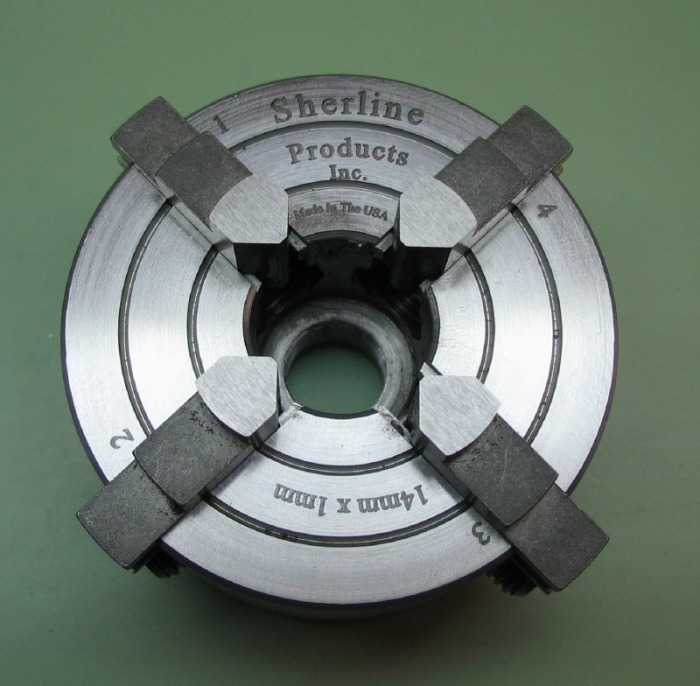 Other types of specialty collets, such as pot chucks, are available through Sherline, as well as Derbyshire and Levin. 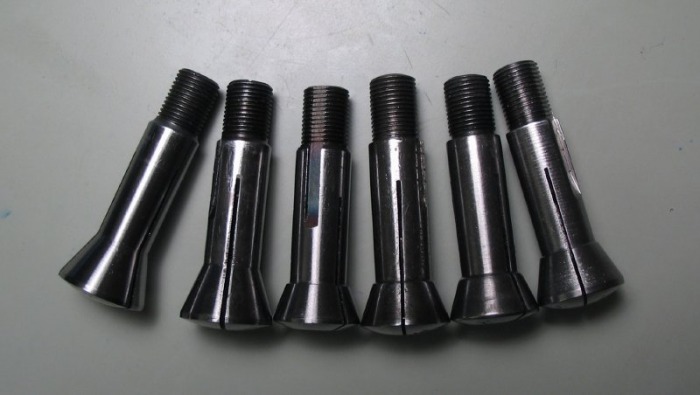 These are a machinable collet for holding larger diameter objects. They are available in different diameters, and this is a 1.25" pot chuck blank, which I use, for example, when fitting the barrel arbor. 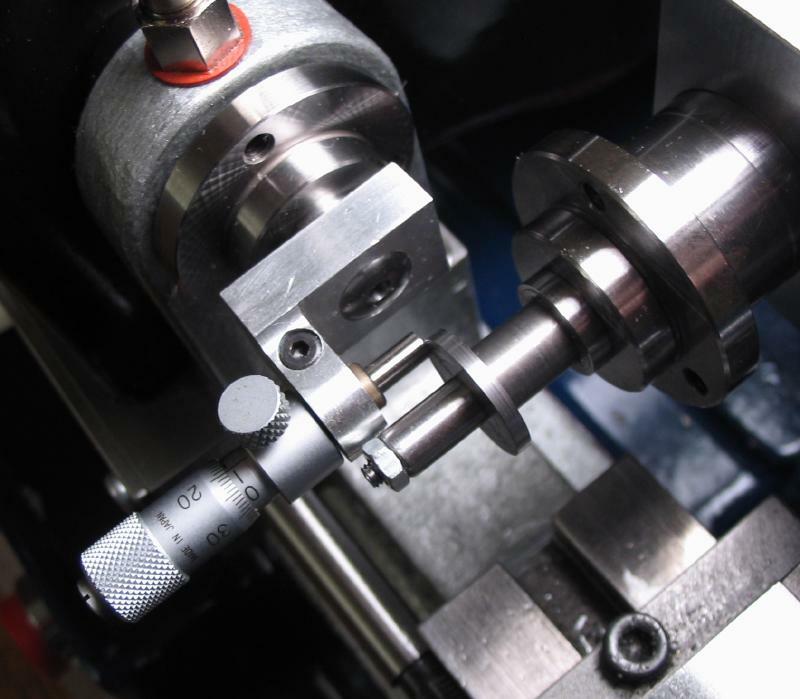 They are supplied with a removable center pin, so that the collet can be tightened in the headstock for machining to the desired dimensions. 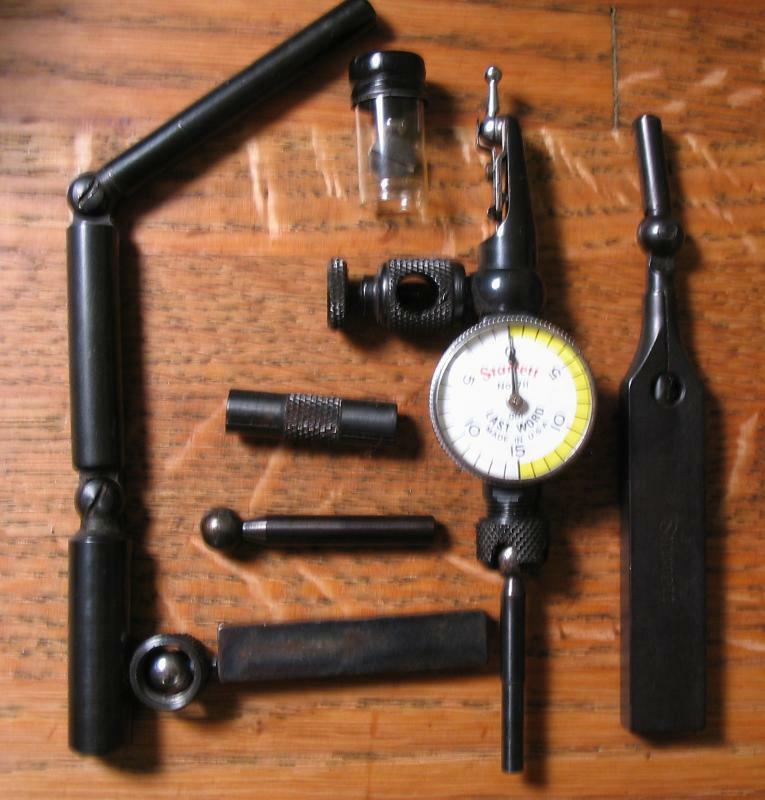 An assortment of step chucks is a standard accessory that was/is available from makers of watchmaker's lathes. They are similar to the pot chuck shown above and are intended for holding thin disc-shaped work, and can be quite handy if the diameter of the work matches one of the premachined steps. 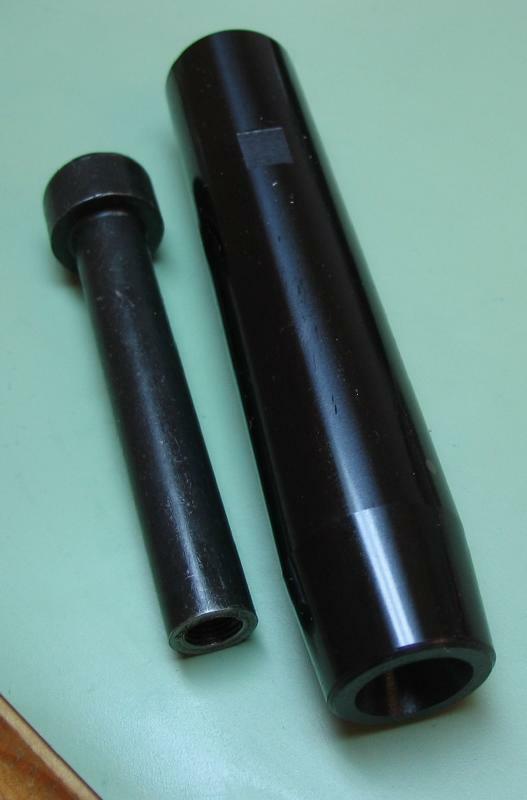 Shown below are two sets that were manufactured by Levin and referred to as the "large" style (1" diameter head) and "midget" style (5/8" diameter head). Both sets have five chucks with nine steps in each. 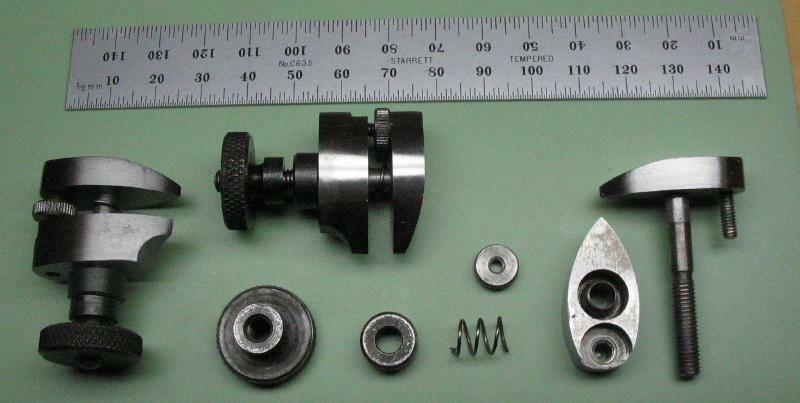 The large chucks have steps in increments of 0.4mm and the midget chucks are in steps of 0.2mm. The step diameters available between the two sets are overlapping but complementary. See the PDF below for a chart of the specified step diameters. I believe these were originally supplied in a small leatherette box, but, as here, the chucks tend to outlive the box. A collet holder can come in handy for various tasks. 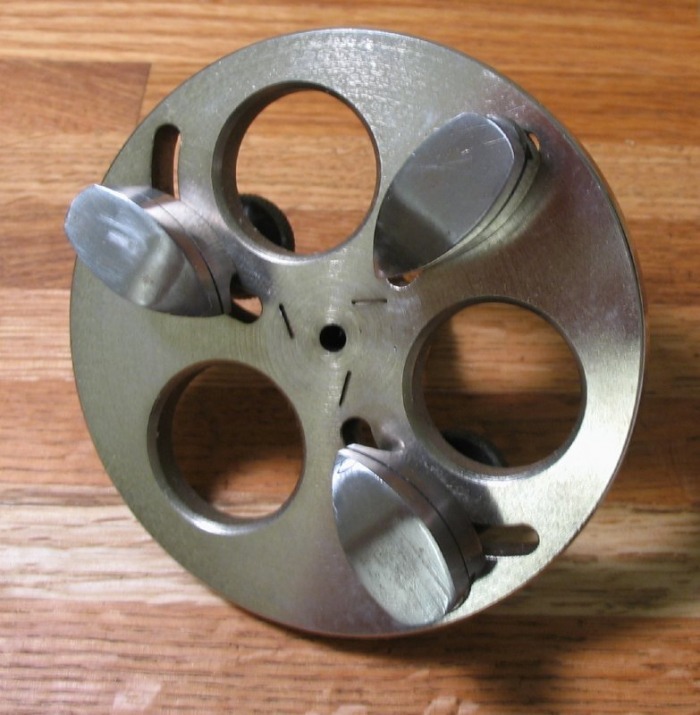 I am not sure what this particular setup was intended for, but it holds standard 8mm collets, with a drawbar. Useful for holding chucks while mounting the work, or for use as a specialized pin vise for holding more delicate parts in a collet. 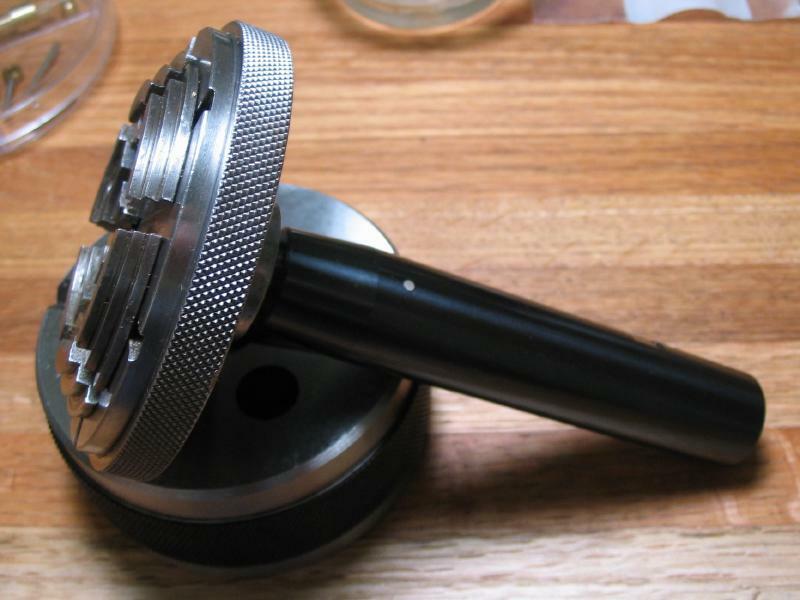 A standard accessory with a watchmaker's lathe is the wax chuck. 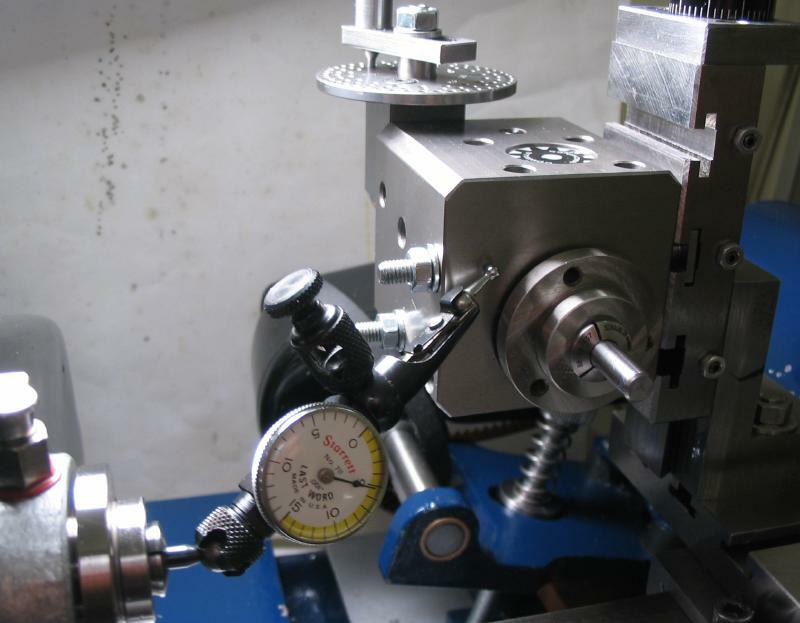 I use this type of workholding for a number of different jobs described on this site. I usually use super glue in place of shellac or wax as was the traditional technique. 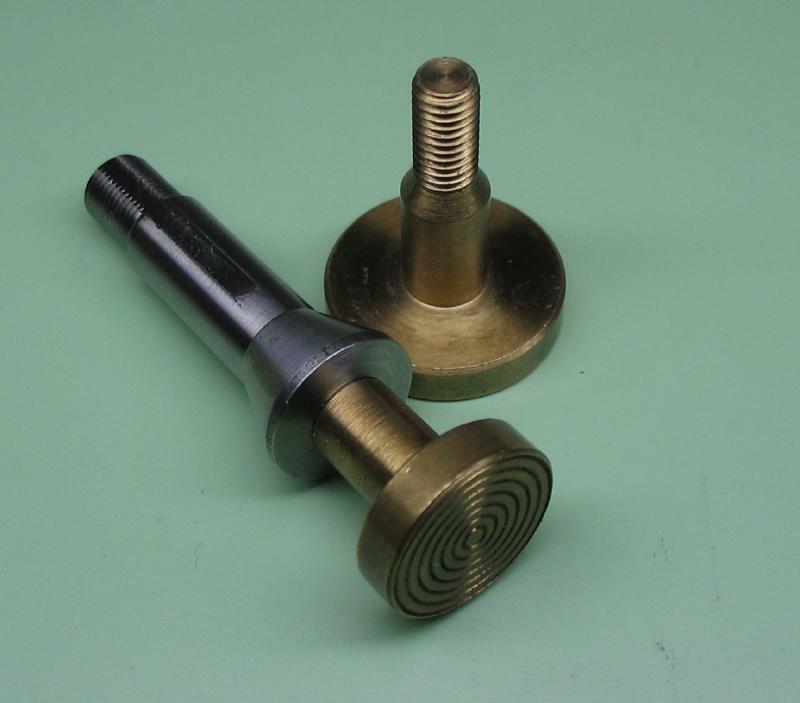 The collet has 5mm threads and various brass arbors can be screwed into place. The stock arbors are shown in the photo. These arbors are fairly easy to make and can be made to suit a particular task. 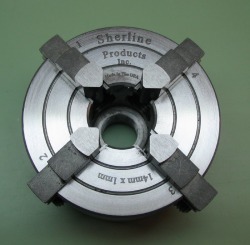 I purchased a Sherline 4-jaw chuck for use on the Cowells lathe. 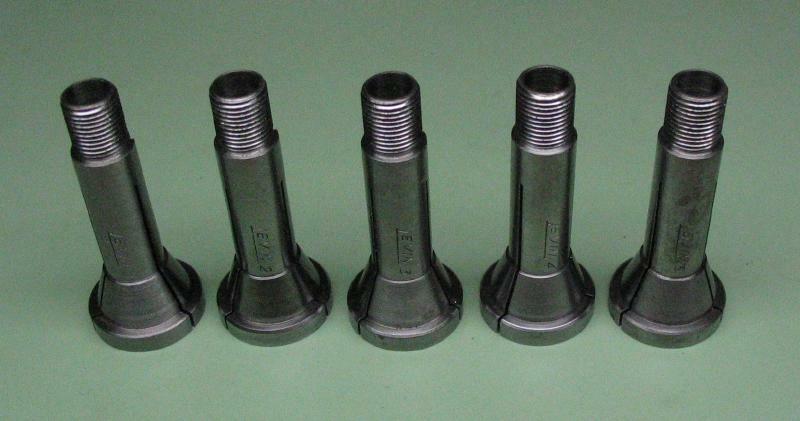 They offer a version of their standard 2.5" chuck with M14x1 threads. Their chucks are well made. 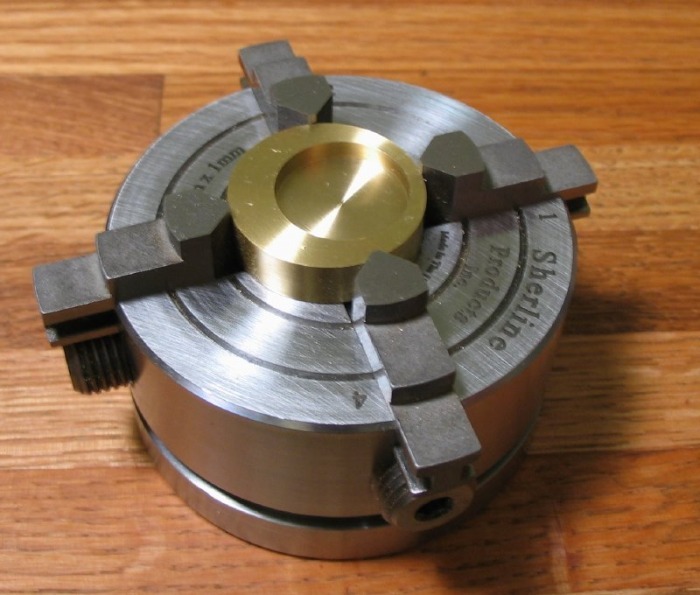 The problem to note, that I had not considered when purchasing, is that the chuck has a different register diameter compared to the Bison 3-jaw chuck, and, therefore, does not screw onto the spindle adapter properly. The chucks sold by Cowells (e.g. the 3-jaw Bison 7-810-0214) has a register of 0.56" (14.224mm), however the Sherline is smaller. When discussing this with Mr. Childs (at Cowells), he indicated that the Sherline register is 14.013mm (I could not find this information on Sherline's website). To accommodate this chuck, a second G13 chuck adapter was purchased from Cowells and turned down to match the Sherline diameter. This type of chuck is very useful for turning non-round objects or for turning objects off-center. They can also be used to center an object very accurately since the jaws can be moved independently. I also purchased a 3/8" capacity Jacobs chuck on a WW collet shank. This was an Ebay purchase, although a similar chuck is available from Cowells. The extra large capacity is useful on some occasions, however, it is generally a bit large for this size lathe. 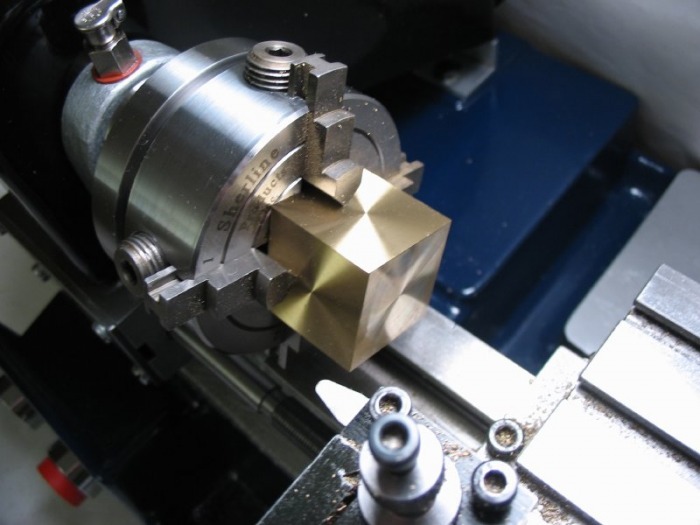 A bezel chuck, scroll chuck, or six-jaw chuck is useful for accurately holding circular, relatively flat, and large in diameter objects such as discs, large gears or wheels, or a case bezel (hence the name). There is only a couple makers of these types of chucks and they are quite expensive. They have been put on my long term purchase list. 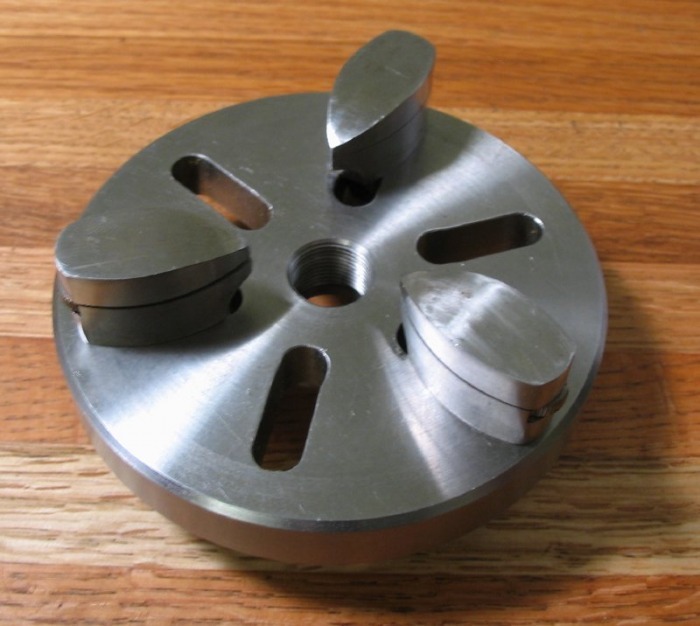 Maprox gmbh (Switzerland) makes a variety of this sort of chuck (as well as three and four jaw chucks) and is the supplier to various lathe makers, such as Levin, Schaublin, Horia-Steiner, Bergeon, Boley, etc. See their catalog below. A German company, Koch Maschinebau, also makes these sort chucks, and are somewhat more reasonably priced. In the meantime I picked up a second hand one. It is a combination type, having both inside and outside holding jaws (the jaws can not be reversed). It is in fair condition, and is quite useful for various tasks. I had hoped it would be large enough to hold the watch mainplate, but a full size outside holding chuck (such as Maprox) will be needed for that. I already mentioned this accessory on the main Cowells page. 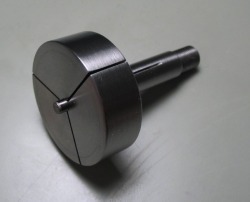 It is a homemade driving chuck, made by a toolmaker in Canada. It was supplied with three dogs, various centers (soft and hard male), two sizes of female, a brass male, and a wood driving center; and a set of Allen keys to fit. 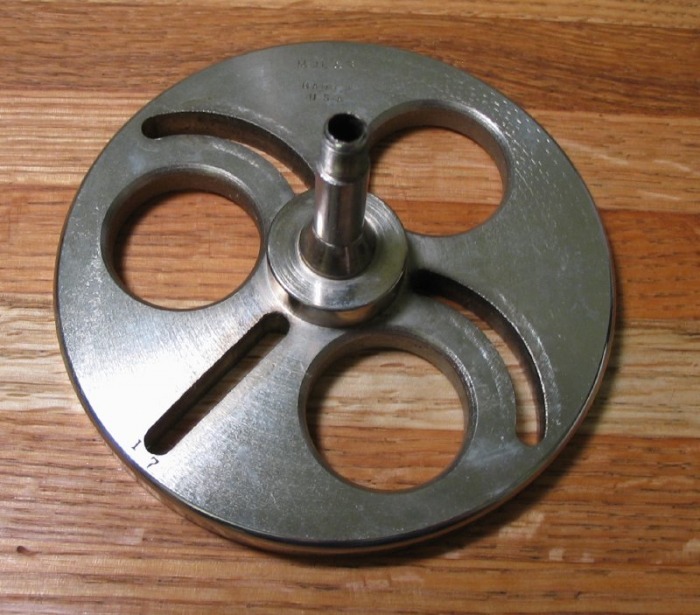 This instrument can be used on the lathe for various purposes. Aligning the vertical slide on the cross slide, centering work in the four jaw chuck, etc. The instrument has various attachments for mounting it by numerous ways. 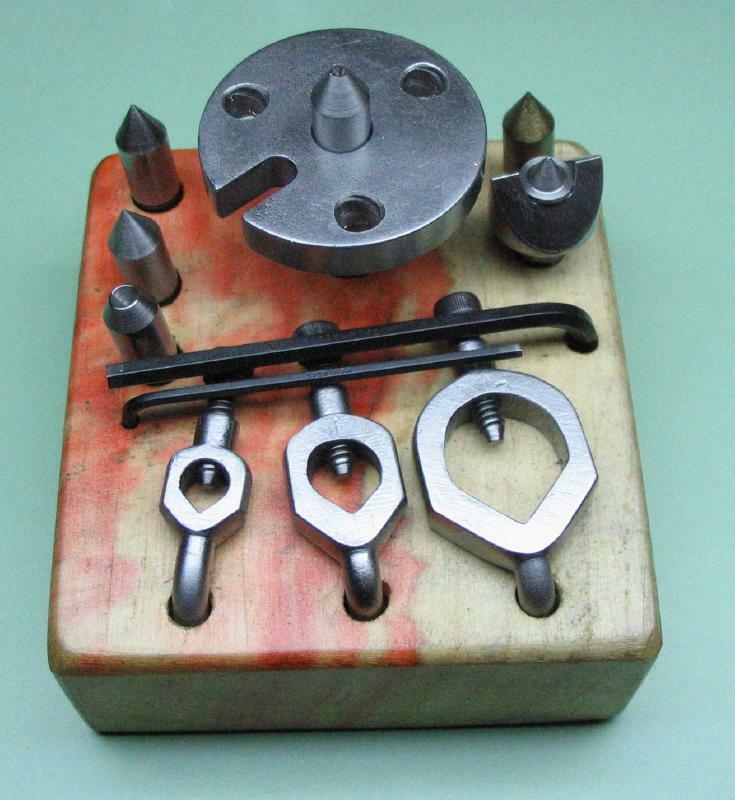 This tool is manufactured by J. Malcolm Wild (Ref. No. JMW1588) , and its use is detailed in his book, "Wheel & Pinion Cutting in Horology." 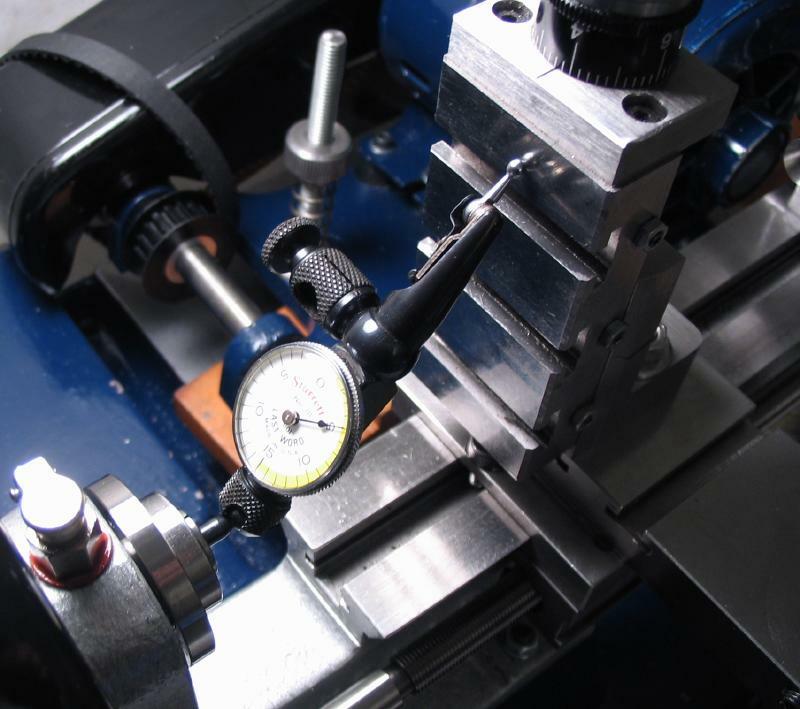 Simply put, it allows for very accurate positioning of cutters on the lathe relative to the headstock center. 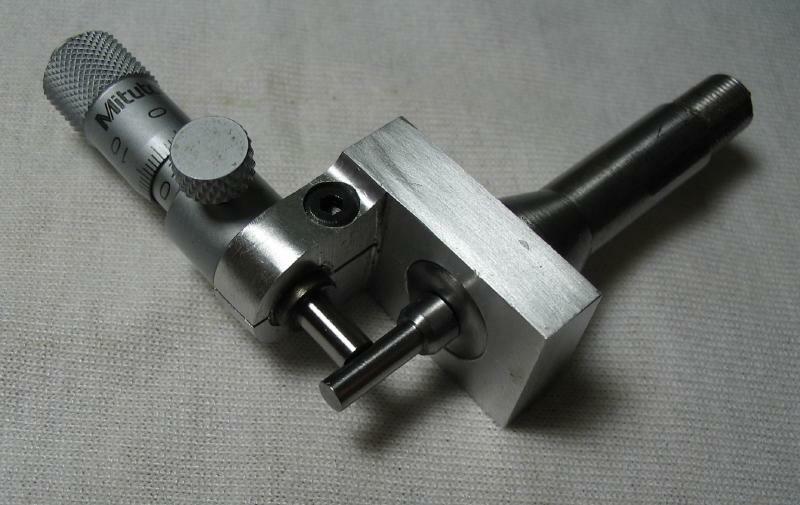 This version of the tool has a 8mm collet shank and can therefore be mounted in the Cowells 90CW headstock. 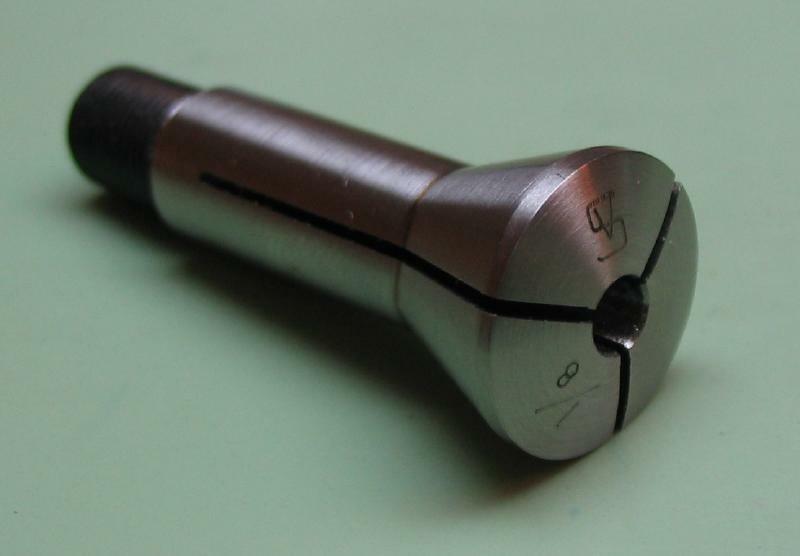 The 3.00mm reference pin is inserted into the tool. 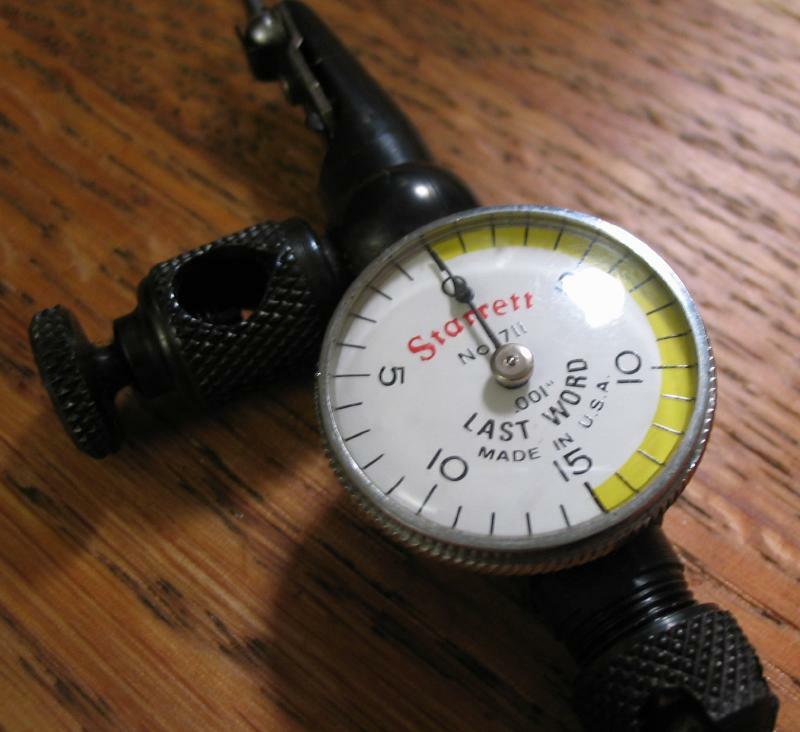 The micrometer is set to 1.50mm (i.e. half of 3.00), and the anvil face set flush against the pin. 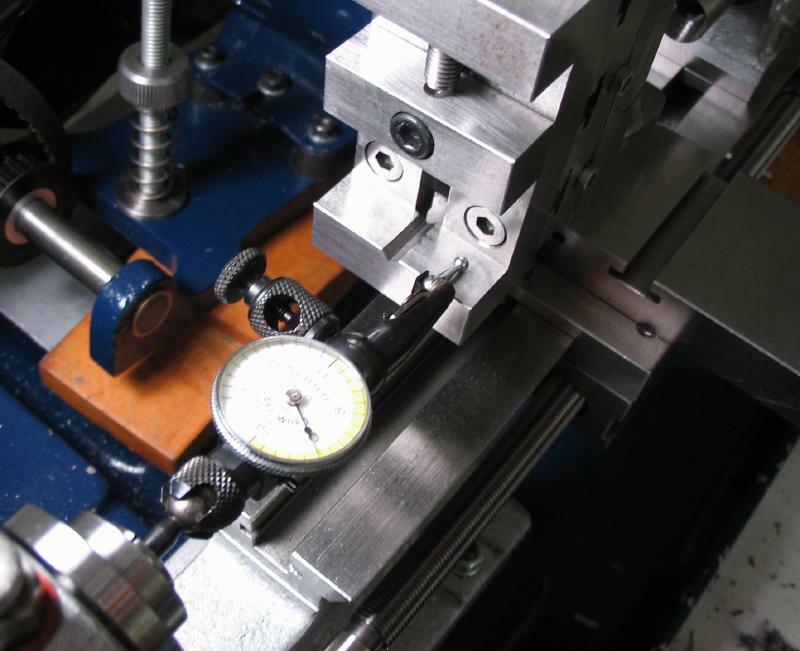 The micrometer is then effectively aligned with the lathe line of centers, i.e. 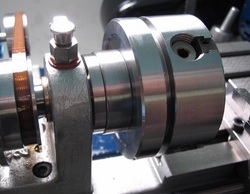 if set to zero it will be aligned on center, if set to 3.00mm the micrometer face is exactly 3mm from lathe center, etc. 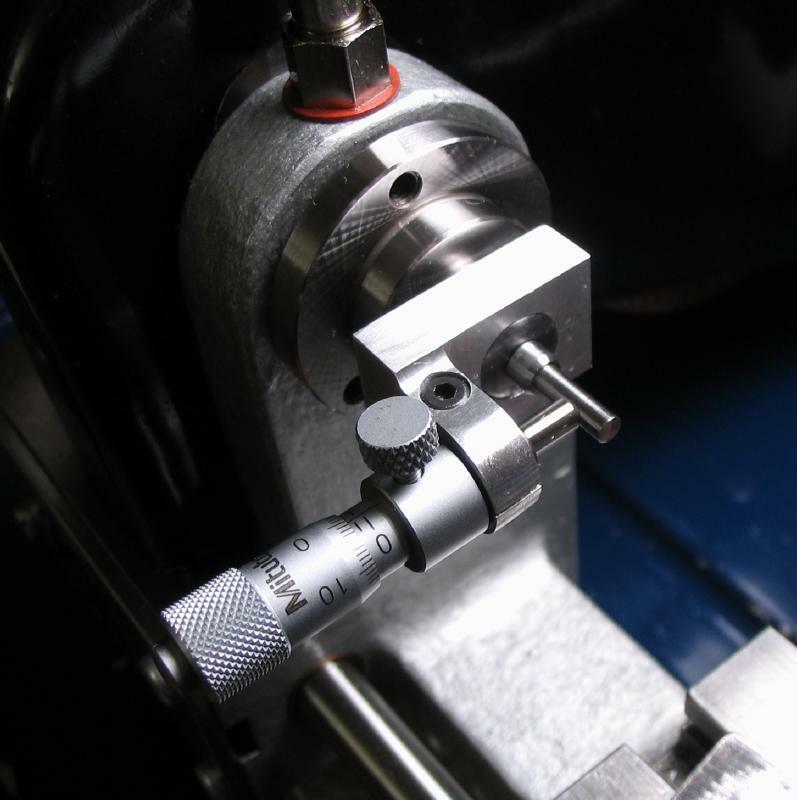 In use, the micrometer can then be set to half the thickness of a wheel or pinion cutter (P.P. 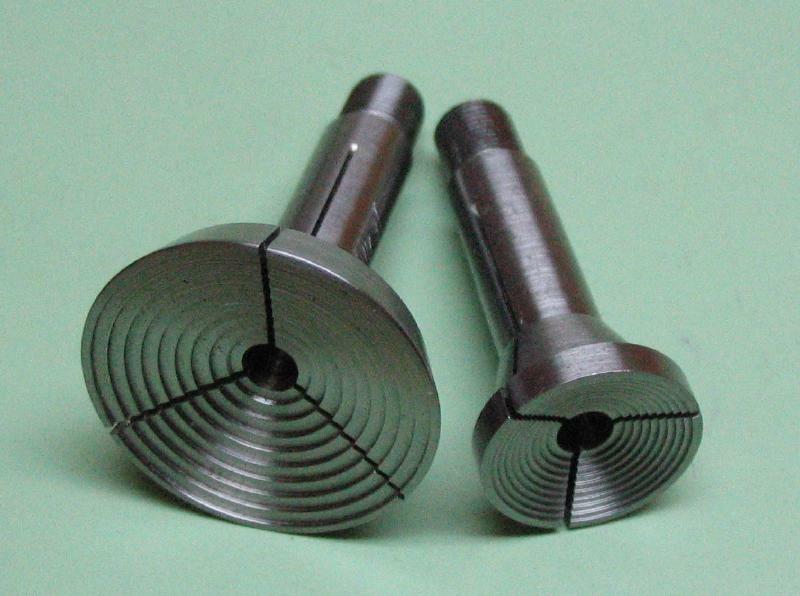 Thornton wheel and pinion cutters, for example, are ground to exacting thicknesses), and the hub of the cutter is set flush against the micrometer face. The cutter will then be exactly on lathe center. Another very important use, and the reason I finally broke down and bought one, is that it can be used to accurately set a cutter offset, by simply setting the micrometer to the required distance. This takes the guess work out of setting up cutters on the lathe. I was previously using a male center in the headstock or tailstock and lining up the cutters by sight (albeit with an 10X eyeglass). This latter method can work fairly well, and sounds simple enough, but in practice it is not always a sure bet. 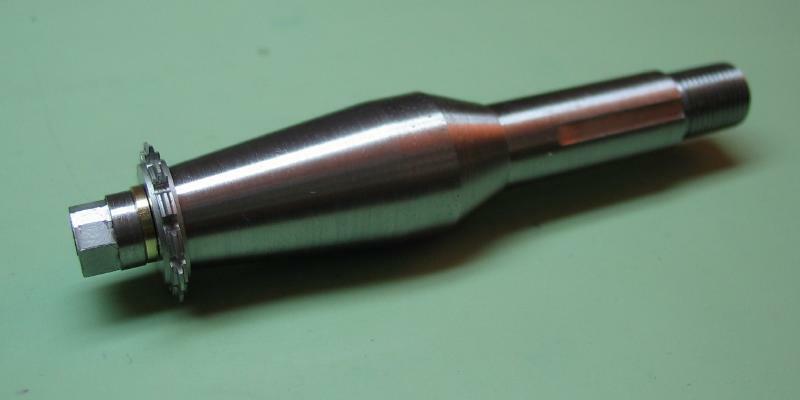 When milling small pinions, the slightest offset will result in incorrectly shaped leaves (i.e. 'leaning' leaves), in which case the work is ruined. 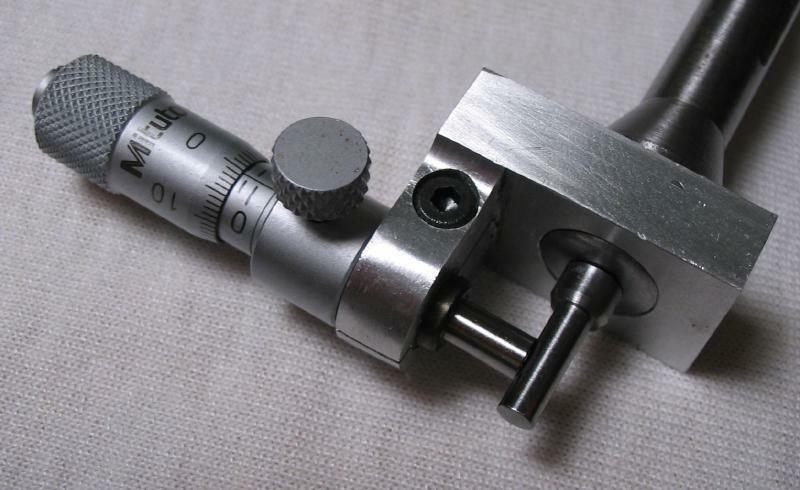 The micrometer head is a Mitutoyo (No. 148-220), accurate to 5 microns, with a locking screw. Centering a cutter blank, as an example. Setting an offset with the ratchet cutter, 1.500mm from lathe center. I intended to put cutter on center for the photo, but looking at the photo , I obviously did not! 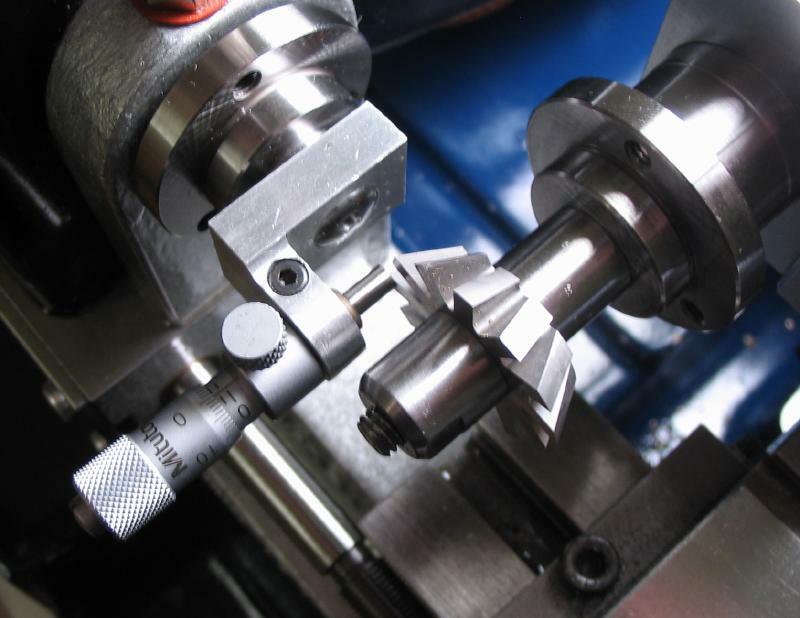 The pinion cutter arbor supplied by Cowells is too long to fit within the bracket of the centering tool, which is necessary when using the tiny watch pinion cutters. 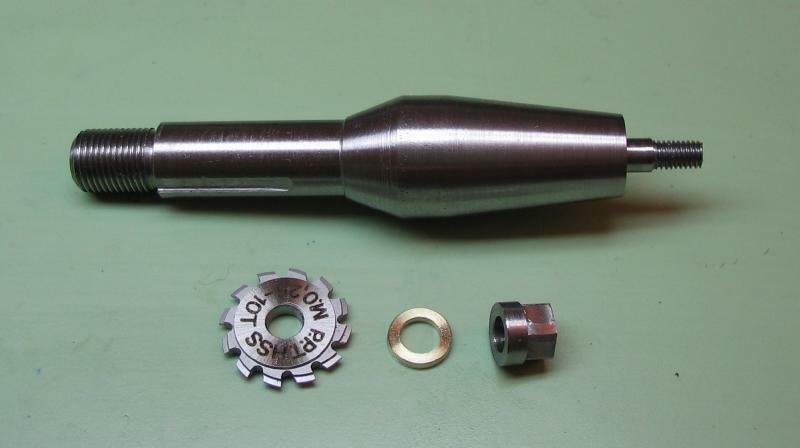 A new 3.50mm arbor was made (details can be found on escape wheel tooling page) which has a shorter mounting/screw length. The Arthur R. Warner company in Latrobe, Pennsylvania manufacture, among other tooling, sets of lathe tools in various standard shapes. These differ from many insert type tools in that they manufacture inserts made of 'high speed steel' (HSS), rather than carbide. HSS is more forgiving than carbide, and less likely to chip. They can often be sharpened on bench stone a number of times before used up. 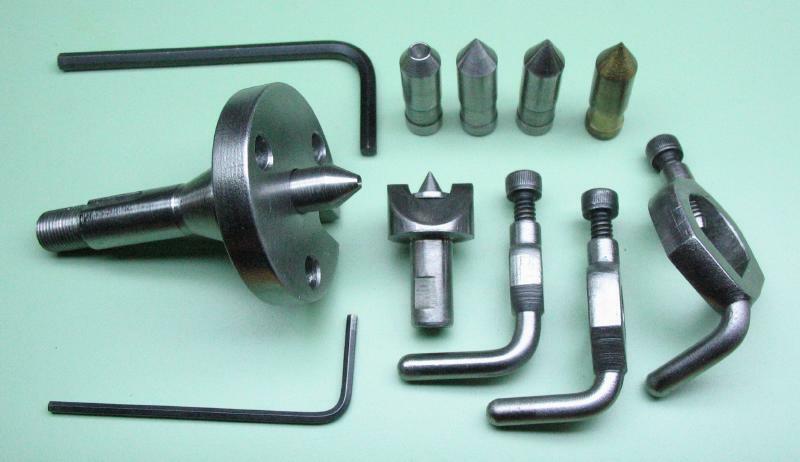 Shown are the right-hand turning tool, and a combination left-hand turning tool & facing tool, as well as a grooving/cut-off tool. The inserts are the same between the turning tools (CCMW-2-1.5-*) and various tip radii (*) are available, but I tend to use the smallest. The cut-off tool has various thickness inserts available, shown are the ones which came with the kit (0.015", 0.031", and 0.062"), and again I find the thinnest size most useful for parting small work. 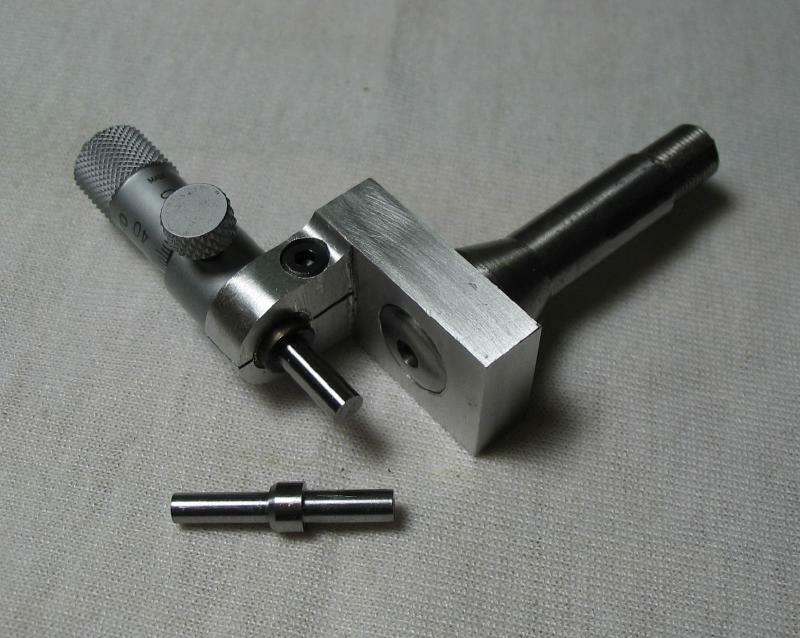 This is an adapter that can be mounted in the cross slide tool post which will accommodate a Foredom No.30 flex-shaft hand piece. These are made by Alisam Engineering, however, they do not normally make one that fits into a 1/4" tool post. They modified one of the 1/2" models as a custom job. I purchased a second hand faceplate in hopes of using it on the Cowells 90. It is a M J L & S - Made in USA. I do not currently know anything about the maker. Unfortunately the diameter of this faceplate made it slightly too large to be mounted. I decided to keep it for now, since at least the clamps can be used on the Cowells faceplate, and it can be used in other capacities on the Cowells, such as in the dividing head. Grinding on the lathe is generally not advisable, grinding dust is obviously very abrasive and if allowed to make its way into the mating/moving parts of the lathe, it can cause accelerated wear and/or damage. However, if done sparingly and with caution, some grinding jobs can be carried out. 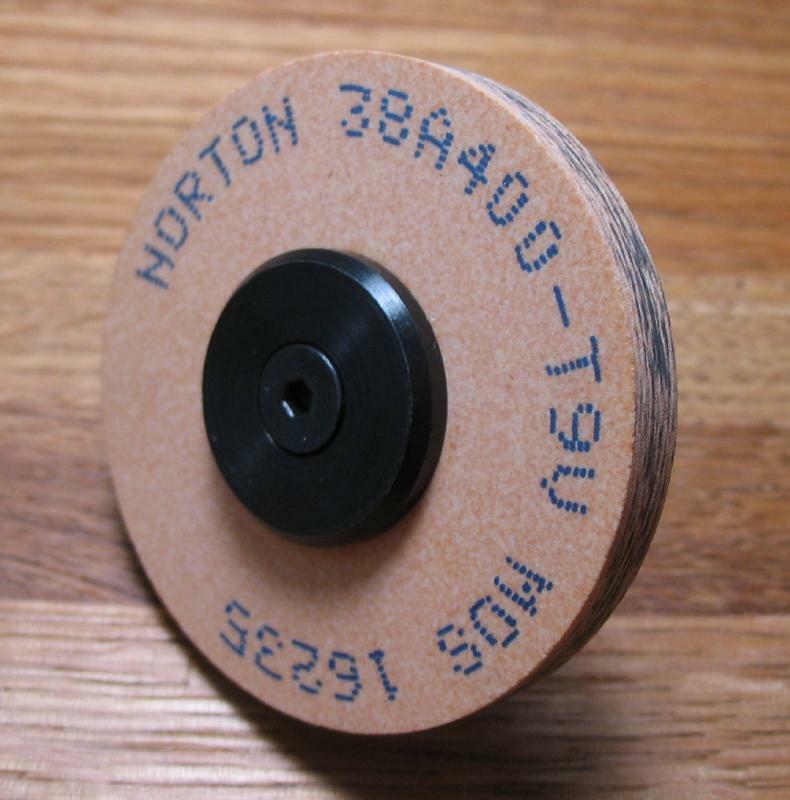 Shown below are a Norton 38A80-K5VBE and 38A400-T9V grinding stones mounted on Levin #0041-03 WW arbors (1/4" mounts). These wheels are also sold by Levin, and are 80 and 400 grit. 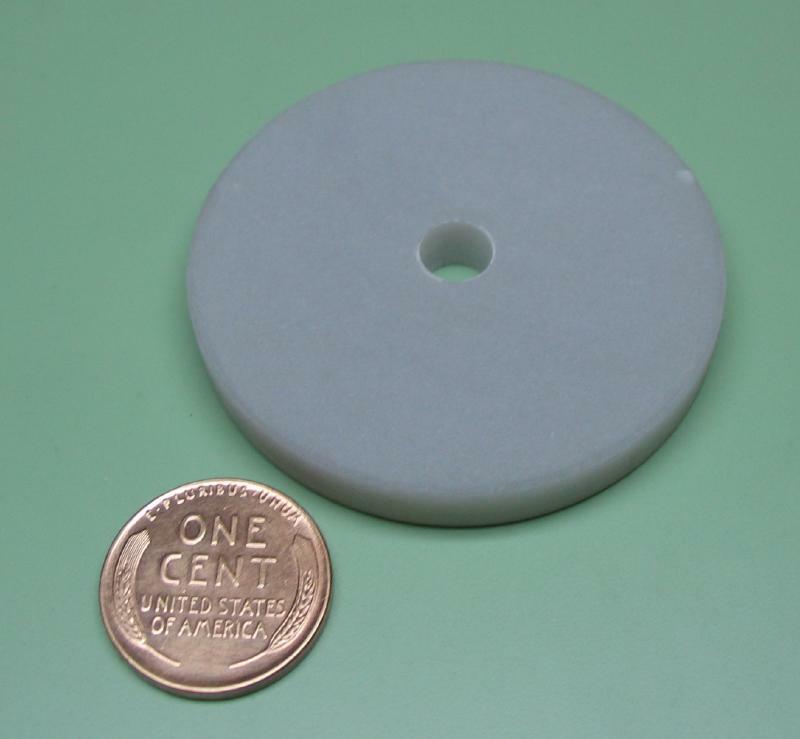 Also shown below is a hard Arkansas wheel with 1/4" center hole. 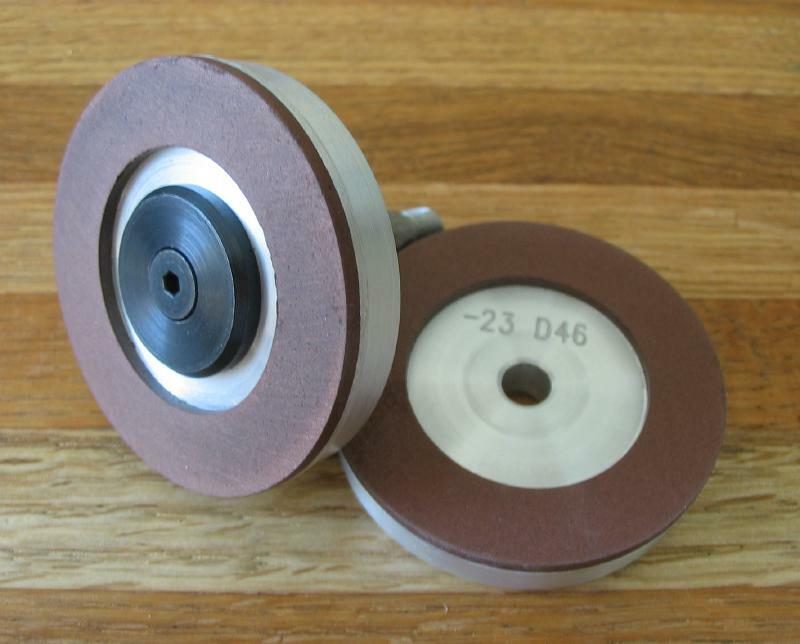 For grinding carbide, diamond wheels are needed. 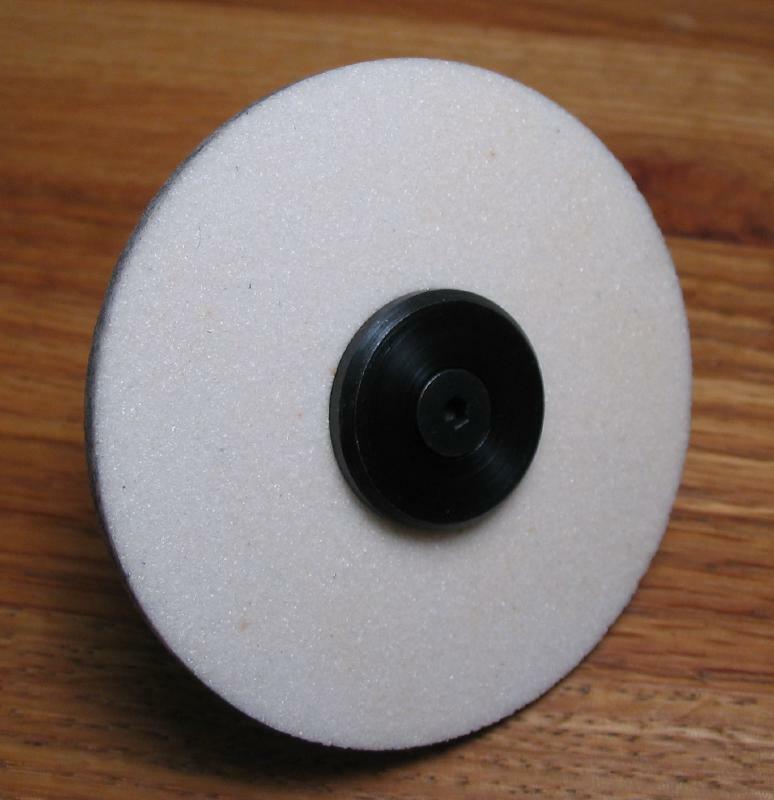 Eternal Tools in the U.K. sells these diamond wheels in various coarseness. 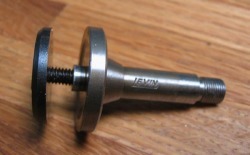 They have a 1/4"bore and can be used on the same Levin arbors, or Eternal sells a collet-shank arbor as well.